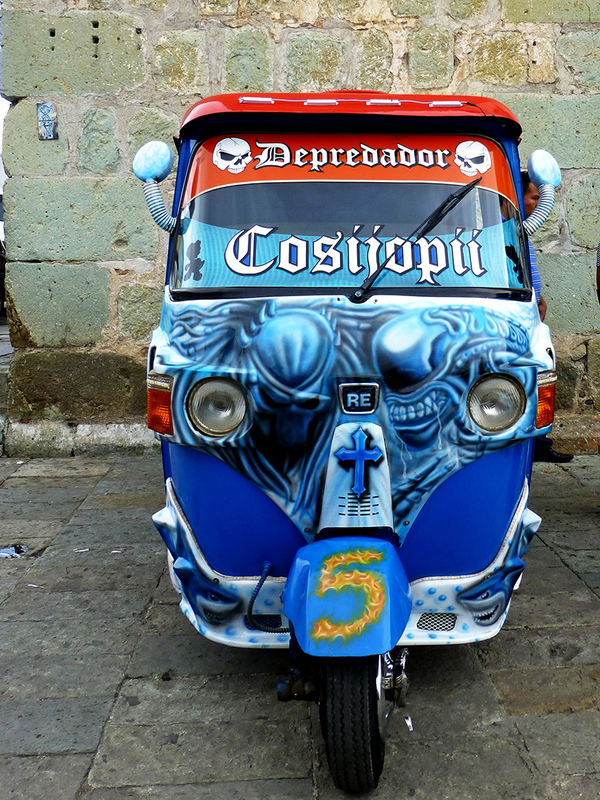 VW Beetles aren’t the only tricked out small vehicles on the road in Oaxaca. 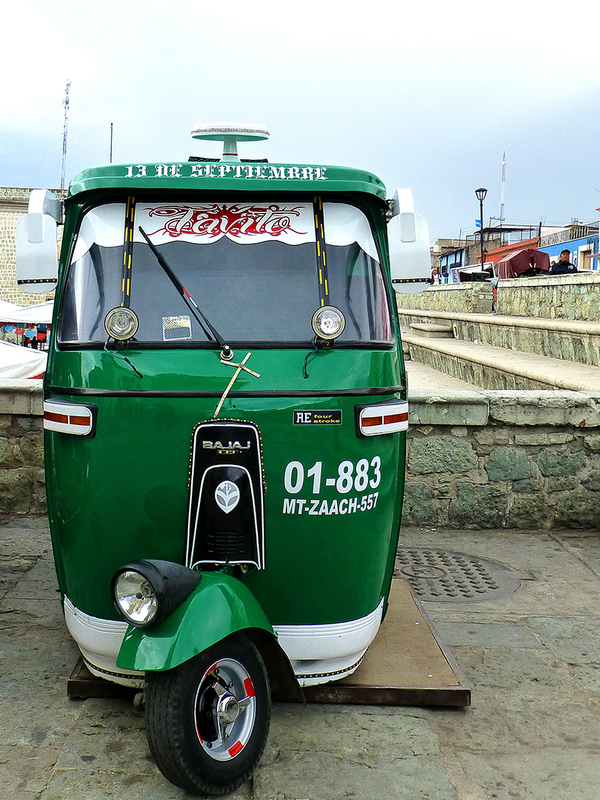 While not allowed in the city, tuk-tuks (moto taxis) have become indispensible in ferrying passengers into the villages from bus and colectivo stops along the carreteras and up, down, and around the often narrow and dirt paved streets within villages where cars remain a luxury. You haven’t lived until you’ve ridden one down a rocky embankment, forded a stream, and then climbed back up the bank on the other side — all without tipping over or getting one’s feet wet. Talk about the little engine that could! Most are utilitarian looking. 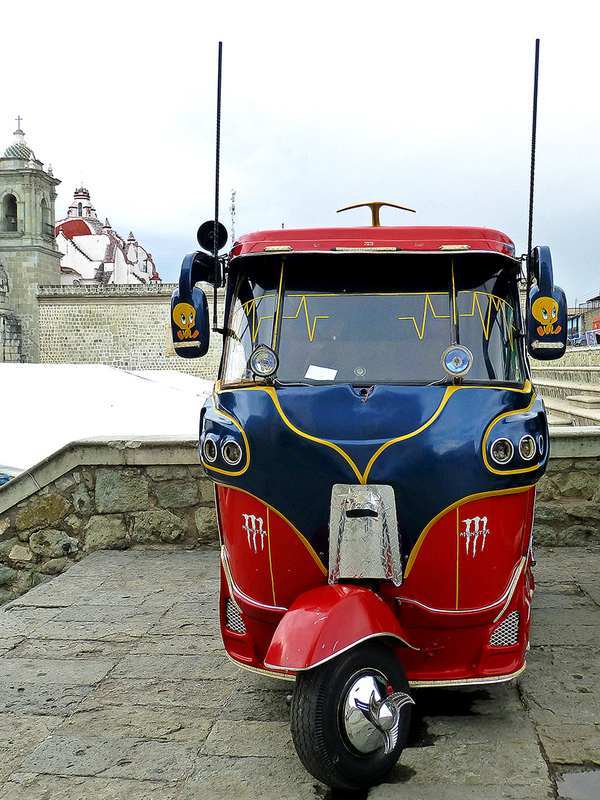 However, one day these tricked out tuk tuks appeared above the Plaza de la Danza. If you’ve got a little money and a large imagination, voilà! They look very smart, all painted up. Sheesh, riding up to hillside homes and fording streams in Teotitlán was harrowing enough for me! Mexican creativity just never ends! Makes life colorful and thought provoking! I remember the first iterations of these. They started as a sort of rickshaw, pulled by a bicycle. Next came the powered model with that same rickshaw being pulled by a small motorcycle. Then those carriages were tricked out a little, but still pulled by the motorcycle. One day in Matatlán I was riding through town on a dirt road when we just totally flipped. From there, the form went to the earliest version of what Spixl displays in the post. Take a look. The Tuk Tuks, or motos as I know them, are a very efficient way to get around in the small towns and colonias that dot the Oaxacan landscape. Even if they do anger the “real taxi” drivers. Thanks for the reblog! And, yes, alas the taxi vs motos tension continues.